The Extra Long scarf my mom made me. This is the first pattern I ever made. It's the pattern I teach people when they're first learning to knit. They start the pattern knowing nothing of knits and purls and by the time they've finished, they're confident in knitting, purling, and switching between the two stitches mid-row! I've taught my mother, sister-in-law, and several friends how to knit with this pattern and now, I'm going to teach you. For this scarf, you'll need a skein of Lion Brand Jiffy Thick & Quick (or a yarn equivalent) and size US 11 needles. If you want to get a lot of practice, or make an extra long scarf, pick up an extra skein of yarn. Now, for those of you who are completely new to knitting, here's some videos from KnittingHelp.com that will get you right on your way. Trust me, they're how I learned to knit. If there's one mistake you're going to make, it's likely dropping stitches. I've shot a video to help you recover dropped stitches, refer to it as you need. http://www.knittinghelp.com/videos/cast-on I prefer to use the Long-Tail method, but if you've watched the video and are still struggling, go with the Knitting-On method. It's not as stretchy, but it'll help you get the basics of the knit stitch and it'll get the job done. For this scarf you'll only need to know the basic stitches: knit and purl. 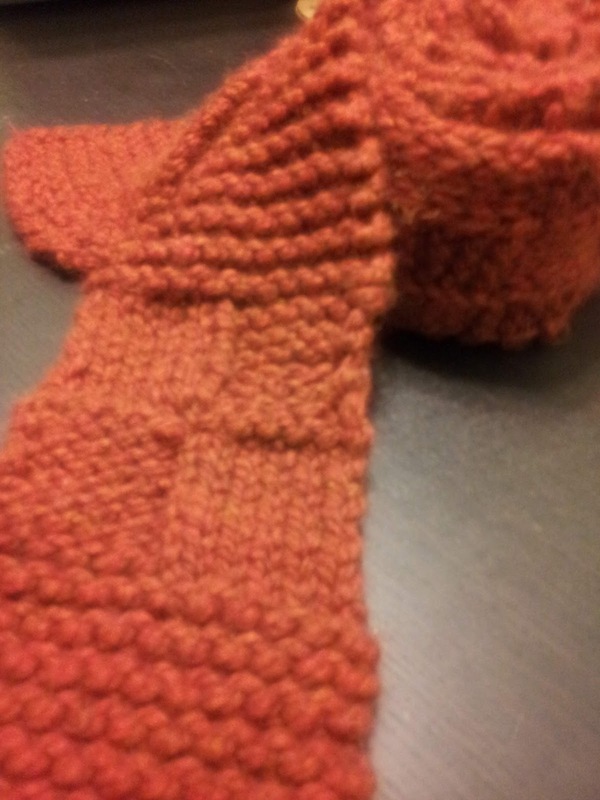 The scarf starts with the knit stitch for about 12 rows, so learn that one first. Then, when you reach the second panel, you'll knit and purl in the same row. By the end of the scarf you'll be 100% confident with knitting and purling. A note on style: There are two ways of holding your needles and yarn, Continental & English. I find that in general its easier for beginners to use English and later transition to Continental. English gives you more control over the yarn (though be mindful of pulling your stitches too tight! ), while Continental is easier to get into a "mindless rhythm" as it uses less movement. In general, though, you should use the same method for the entirety of a project as each tends to give you a different tension. 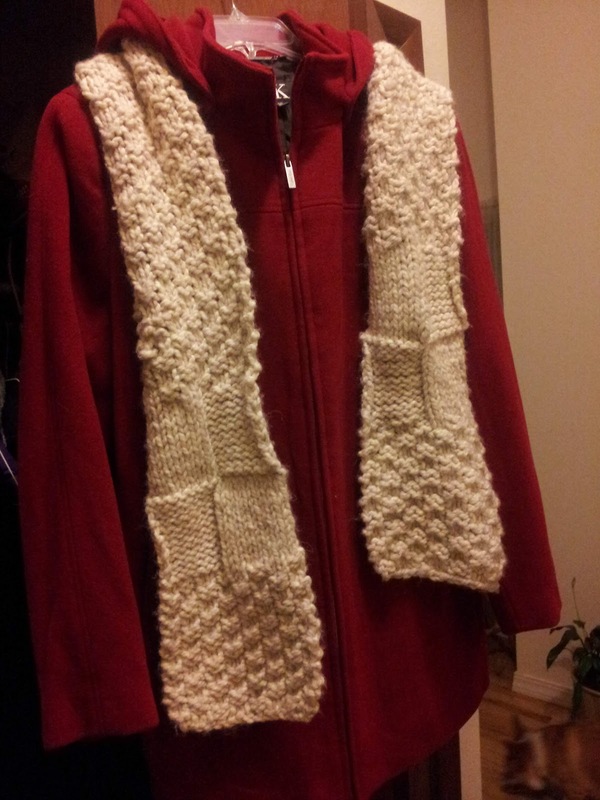 This scarf is made up of several 12 stitch x 12 row panels. Each panel is some variation of knit and purl stitches, but will always be 12 stitches wide and 12 rows long. There's some flexibility in how long you make the scarf, but the first 9 panels are the same no matter. With this first bit of the scarf, focus on keeping your stitch tension even and always ending a row with 12 stitches. You should now have a something resembling a square, though don't worry it it's not exactly right. This block is done in Garter Stitch, which is what you call it when you knit (or purl) all rows. Feel ready for the purl stitch? Cause here it comes.. Be mindful of your yarn as you bring it front to back, or vise-versa, you might end up with an extra stitch. Also, keep a good tension between the purl and knit stitches! Otherwise you'll have a gap. How'd it go? 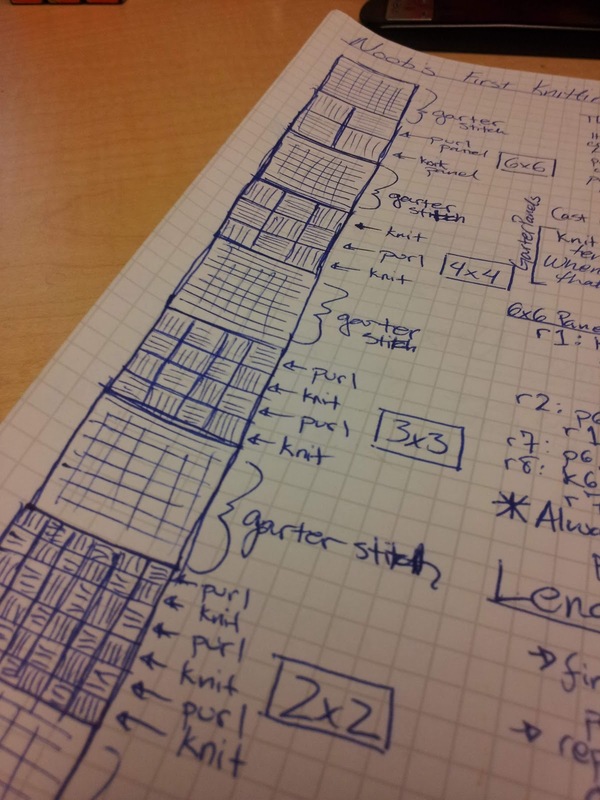 You should have created a panel with 4 blocks of Stockinette Stitch. That's when you alternate knitting and purling rows. Now we're going to do another Garter Stitch panel. You can purl or knit and still get Garter Stitch, but let's purl all the rows this time, just to get the practice. Feeling better about purling? You should have a panel that looks exactly like your first one. Don't worry if it's a bit off, everything will even out after a few wearings. Time for more alternating. Pay close attention to the rows, I'm gonna switch it up twice on you. Right, so that panel should give you 9 blocks of Stockinette. Do you feel more comfortable about switching between knitting and purling? Let's practice just knitting some more. Work in the same way as directed above. You should be feeling pretty good about knitting by now. Let's go back to alternating. Pay attention! 3 switch-ups this time. A version made by alternating 2x2 and 6x6 panels. You should have 16 Stockinette blocks in this panel. Time to practice your purls. 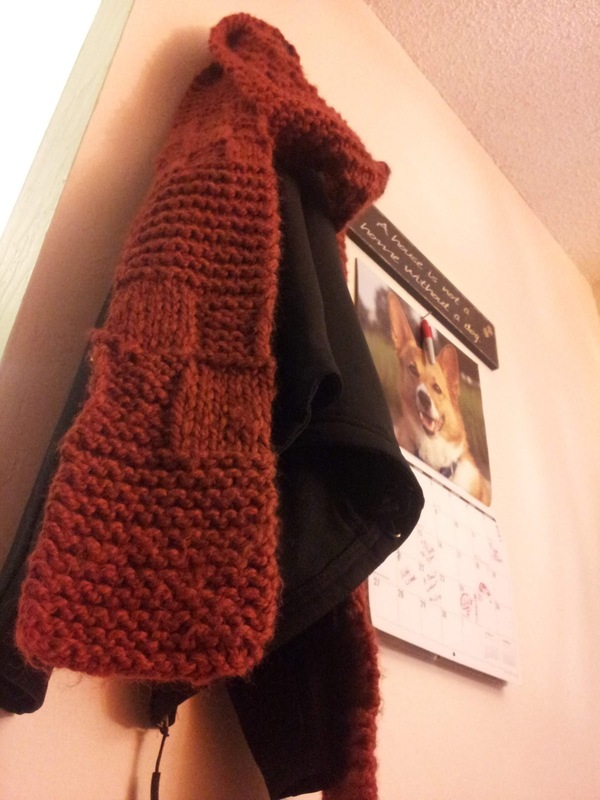 Last alternating panel (for a regular sized scarf). How's it look? You should have.. um.. a lot of blocks. 36, I believe. Ready for the last panel? It should be super easy now, promise. 6x6 panels on the ends. You should be damned proud of yourself. You've just made a scarf! That's right, you're done! Well, unless you want to make it twice as long and keep practicing.. Up to you. I have a double length one my mom made. It's 8 feet long. Love it to bits, I do. To make your scarf twice as long as it is now, repeat the pattern backwards, starting with the 2x2 Panel. You'll need another skein of yarn. Feel free to work the garter stitch section in whichever stitch you want more practice in. Otherwise, cast off!! If you're not sure how, here's some videos on Casting Off. I'd recommend the Basic Knit, but it's up to you. For some variations on the scarf, and more practice, pick and choose some of the panels and mix & match as you see fit. This was the first (and so far only) commissioned piece I've made. The buyer sent me a few images of the hat she wanted and gave me the task of recreating it, which I did, with the attention to detail only an OCD engineer can give. I studied the pictures for hours, counting stitches and guessing at measurements. I walked around yarn stores trying to color match skeins to zoomed in images on my phone. At one point I even used Photoshop to get the exact color. The flaps are knit individually first and then the rest of the hat is cast on, joining the flaps to the body for a seamless hat. Yay seamless!! The final pattern was all my own and I'm still extremely proud of it. I only wish now that I had A) taken more pictures, B) measured my gauge, and C) not sold it. But alas, if I hadn't taken the commission, I would have never made it, so I guess I can't complain too much. Anywho, here's the pattern, in all it's ungauged glory. This hat is a step up from my Not So Stoned Stoner Hat and is an easy ear flap hat, knit in the round. R15-17: Work in st. st., knitting all on the RS and purling on the WS. If this is your first ear flap, cut the yarn with about 6 inches from the flap, move the live stitches to a spare needle or waste yarn and make your 2nd ear. If this is your 2nd ear, then you're ready to move on!! If you haven't already, move your stitches to the needles you'll be using to make the rest of the hat, be it circulars or DPNs. You should be on a RS row of your second ear flap. Knitting on the stitches on the ear flap: kfb, k18, kfb. Pick up your other ear flap and knit the stitches from it (you might need to move the stitches to your left needle first): kfb, k18, kfb. Cast on another 12 stitches. Place marker and join for in the round. You should have a total of 80 stitches on your needles, 44 from the ear flaps and 36 that are brand new. This is where it gets mindless. Rounds 2 - ??? : Knit in the round until the hat measures about 6.5" for an adult medium hat. Work for only 5.5" for an adult small/children's size. Cut the yarn with a tail ~12 inches. Now for the fun part! The tassels! Cut four strands of yarn about 20 inches each. Feed the tail and one of the strands through 2 stitches, slipping them from the needles. Pull the tail tight and the strand so that it's ends meet. Take the other strands and feed them each through two stitches, slipping the stitches as you move them to the strands. Pull the strands so their ends are all about even. You should have all your stitches off the needles and 9 pieces of yarn flailing about now. Divide your 9 into 3 groups of 3 and braid, making sure you pull tight!! This is making your tassel as well as closing the top of the hat. If you want to be extra secure, feel free to tie a simple knot with your tail strand and another piece on the opposite side of the gap before you start braiding. Once you've got the tassel to the size you like, tie a basic knot on the braid with all the pieces held together (double knot if you wanna be extra secure), and then trim the ends so they're the length you want and all even. For each ear flap, cut 6 pieces of yarn about 40 inches long. Pull a strand through each of the 6 original stitches on the bottom of the flap until the ends are even. You should end up with 12 strands of yarn. Divide the 12 into 3 groups of 4 and braid, though not as tightly at the beginning as you did on the top of the hat. Braid for 10 inches, or until you decide you're done, then knot and trim the ends. Embroider the dark red one in the center of the hat first. The stars on the sides should be centered directly above the first stitches of the ear flaps (see picture for what I mean). I'm not going to pretend to be an expert on Polyclay. Nor am I going to pretend to be an expert with sculpture. I'm far from being either of these things, that I assure you. What I am is simply a person, a crafty person, that has taught herself with patience and lots of Google searches, how to do a number of things. One of those things is making polyclay trinkets and sculptures. There are several things that makes polyclay a fantastic craft medium. The selection of colors is wide and nearly endless, there are no concerns over drying out while in storage, and the ability to make your creations timeless with only 20 minutes in the household oven are just skimming the surface when it comes to this clay's magic. The biggest problem I've ever had with this clay is trying to narrow down the list of possibilities and actually make something. Even now as I type out this tutorial, I struggle to pick just one of the wonderful little sculptures I could make to demonstrate the basics. Have no fear, though, I'll come up with something. Polymer Clay (otherwise known as polyclay) is a polymer compound that is fact not actually clay. Polymer is a man-made material which has similar features to clay, which is what allows it to be used as such. It never dries out, which makes storage simple, and comes in a large variety of colors. Blending colors with polyclay is as simple as blending colors with paint. Creating swirls and patterns with these colors is just as simple. The only cautions that come with polyclay are that it can dye fabric or other porous materials, and due to it's plastic base compounds, you should never use polylcay items with food - fired or not. For storage, make sure you keep your clay in some sort of container with the colors separated. I use a Tupperware that fits all my clay and tools, so I don't have to go digging around for everything when I want to work. Also, make sure that you keep your clay someplace that's room temperature as it can be ruined if exposed to heat or ultraviolet lighting. The tools for shaping or sculpting polyclay aren't exactly required. You can start using polyclay with just your hands and buy tools as you come across the need, but that might not be the easiest solution. Using the picture above as a reference, here are tools that I use, from left to right. PolyBlade - Blades are used for making clean slices through your clay, either when cutting from a roll or just getting a chunk off the starting block to work with. I use a Flexible blade for all my slicing, as I like the ability to curve it into my required shape. Make sure you're always putting the right side of the blade into your clay - these things are sharp! Wooden Shaping tools - These wooden tools are fantastic for carving out details or helping you shape specific areas. I'm sure there's a break down of what each tool is for, but I'm sure you can figure it out. The really important thing to remember with these tools is that because they're porous, they'll absorb color from the polyclay. Make sure you always clean your tools between colors, otherwise you'll end up with some tie-dyed looking sculptures. Mini Wire Carving tools - Also referred to as ribbon tools, these metal loops are fantastic for carving out small details into your work. You can also use them to carve ribbons or strips from a block of clay. Bead Hole Maker - I'm not sure that's the correct name for it.. but you'll find this tool in the jewelry section of most craft stores. Similar to one of the wooden shaping tools, I find this metal one is more precise for making small marks, engravings or lines in my clay. Also, because it's metal I don't need to worry about it dulling as quickly or dying if I don't wash it immediately. PolyRoller - This is pretty much a cylinder that you use as a rolling pin. It's great for conditioning your clay, rolling flat sheets, smoothing out your clay, or rolling out sugar cookies for a snack. Just make sure you wash it between colors, or cookie batches. First thing's first, you need a flat and clean surface for working. Because polyclay dyes materials so easily, I also recommend you do all your work on either parchment paper, a cookie sheet, foil, or maybe a vinyl placement that you don't care about. Chances are your work surface is going to get a little bit of color on it by the time you're done.. and it's always easier to clean up when you don't need to scrub that color out. Polyclay doesn't dry out like normal clay, but it does get a little hard if you leave it unworked for a long period of time. This is easily reversed with a little bit of conditioning, so never fear. To condition your clay, take the amount you'll need for your project and simply roll it flat, fold it up onto itself, roll it flat again. Repeat this process until the clay is malleable and giving you the amount of resistance that you want. This isn't really an exact science, there's no little button that will pop out of the clay and tell you it's ready - it's all up to you to decide if your clay is soft effort for you to start working with it. 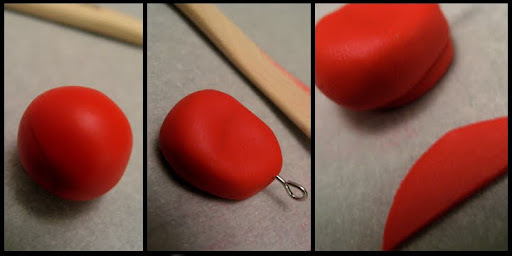 Polyclay is most commonly used for making beads or small trinkets such as stitch markers or jewelry. Pieces over an inch thick won't fire correctly, so it's always good to make sure you don't exceed that thickness with your sculptures. With that said, let's get started on the basics. Just like in drawing, every sculpture is made up of basic shapes that are combined and warped to give you the final product. When you first start sculpting, I recommend you sketch out what you're making and look for those basic shapes. Circles, ovals, squares, rectangles, ovals, cones, etc. Everything you'll ever make will derive from basic shapes and understanding which ones you'll need to make is key. Take a look at Mario's red hat and notice the shapes that it would take to make it. His hat is essentially a flatish circle or oval, with a little dip in the middle. Add a line below it for the edge and a quarter moon for the brim and you have yourself a Mario hat. Put the white circle above the brim, add the 'M', and your miniature Mario can forever hide that bald spot. Even the most complicated of pieces are just a sum of a bunch of basic shapes. Once you figure out which shapes are the starting points, you're golden. Start with something basic, like a matching Mario hat, Mario Star, or Pacman pieces. Stitch markers, charms and earrings are great for practicing basic shapes. Sketch them if you need help figuring out what basic shapes make them up. If you want to make something that's bigger then the the basics, you'll need to sculpt the clay around some sort of structure, such as wire or tin foil. For this demo, I'm going to build something around foil. First sculpt the basic shapes you'll need with foil. This pretty much means just wad up some foil into the general basic shape you're going for, making sure that it's as compressed as you can get it. For me that meant four cylinders for the limbs and an oval for the torso. I also made a ball for the head, but then decided I didn't want to give him a head. Second, condition the clay you're going to be using for the main section of the creature. 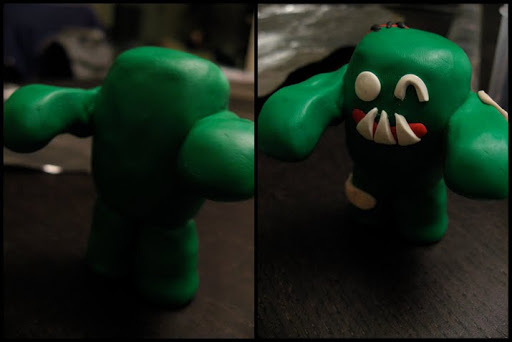 I wasn't really sure what I was going to be making, aside from the fact that I wanted him to be a lil' bit monster and a lotta bits cute. Once you've conditioned the clay, roll out a sheet that's about 1/8th of an inch thick. A little thick is fine, but you don't want to go thinner then that. Third, cut strips out of the sheet and use them to cover the foil shapes. Use your fingers or tools to smooth all the seams closed. If you're making a mummy, cut the strips thinner and don't smooth them together. Once you've got all the foil shapes covered so that the pieces are smooth and no foil is showing through, assemble. After you've got all your basic shapes, no matter how big or small, it's time to put them together. Feel free to use more clay to make sure that everything sticks together. Also feel free to use more clay on the basic shapes to add more thickness, texture, or details. It's typically easier to add more clay then to take it away. If you're adding a hook to make the piece into a charm or stitch marker, do it now and make sure that it's secured. I like to put a bend in the hook so it's not possible to pull straight out once the piece is fired. When you've got everything put together and smoothed out to your liking, it's time to add the details. Some details you can add after you've fired the piece, but I like to add as much as I can to the piece before I fire it. Little things like textures, lines, and even dots can really add to a piece. It takes practice to learn what makes or breaks a piece, so feel to experiment and find out what works for you. The great thing about this clay is that if you mess up, not all hope is lost, especially if you're just working with one color. The fact that you can fire most all polyclay projects in a standard oven is one of the best things about it. Most clays require 275 degrees F and 15 minutes for every 1/4 inch of thickness. I would be sure to read the directions for whichever brand you're using as it does vary. The packaging says to not over bake, but I've never had an issue with over doing it for a couple of minutes or so. Our Zombie friend pictured above spent about 40 minutes in the oven. I sincerely hope this isn't the end. As I've said a couple of times in this tutorial, sculpting polyclay isn't an exact science. There is definitely some technique to it and then there's a lot of bits of creativity. I encourage you to just practice and play with the clay. Don't worry if it's exact, just make sure it makes you happy. As Ms. Frizzle always said, get dirty, make mistakes. This tutorial is only meant to be a beginning when it comes to what you can do with polyclay. 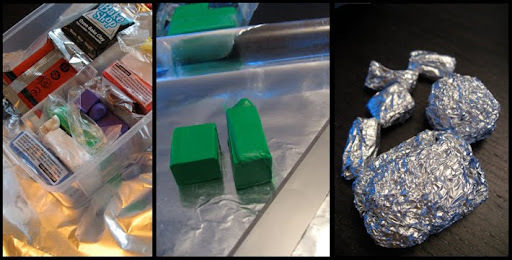 There are several different kinds of polyclay to experiment with, as well as numerous different ways to manipulate it.